Feng Shui is a philosophical system which originated from China. It is an art of harmonizing the energies in any surrounding environment in order to help people attract health, happiness, love, success or wealth. Because of their natural beauty and grace, flowers are used in Feng Shui as a tool to let positive energy flow through the home. They bring joy and brightness to any space by promoting a healing, peaceful energy. Here are the most important tips on how to incorporate flowers into your Feng Shui practices so that you can easily attract the fortune in your life. Your living area should be decorated only with fresh flowers. Wilted blooms can attract negative energy which is not what you aim for. You can also use silk flowers, textiles with floral prints, beautiful flower photos or any other home décor piece featuring flower patterns. They will all increase the positive feeling at your home. Decorating with freshly-cut flowers, however, is the most efficient way to bring good Feng Shui energy and focus the positive feel at one space. Flower type and colour also influence the Feng Shui energy in your home. 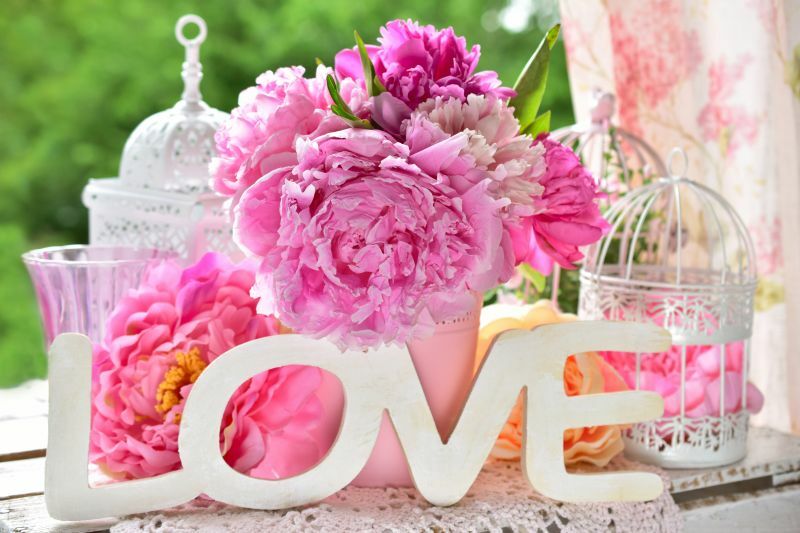 Pink peonies are used in Feng Shui to attract love and romance.The energy of new beginnings, hope and happiness is often attracted by using blossoming flowers of apple, peach, cherry or any other blossoming fruit tree. The best known symbol of fertility according to Feng Shui is the orchid, which is also considered to represent spiritual growth, purity and abundance. Golden yellow chrysanthemums are thought to symbolize the sun, thus they deliver the positive, joyful energy usually brought by the sun. Career growth is usually affected positively by white narcissus. In order to make the energy even more powerful, you need to place the flowers correctly. As we mentioned, peony is used to attract love and romance thus it should be positioned in the Relationship Area of your home. Being symbol of the career success, the narcissus should be displayed in the Career Area. Orchid is the symbol of fertility so it might be a good idea to place the flower into your bedroom especially if you are trying to get pregnant. As you can see, the beauty of flowers can contribute to attracting the things that you desire in your life. Be it health, career growth, love relationship, you can use flowers to create the best energy that will help you achieve your goals!